This is really bad. Fairly stiff south wind. Possibility of rain tonight and tomorrow--I don't know what the effect of that would be. Reportedly oil is already contacting that marshy peninsula where Louisiana doesn't so much have a coast as blend slowly into the sea. It won't get to the Alabama coast for another day or so but it seems inevitable that it will; the question is just how much. Update 2: The weather is making things worse. I guess what you say about suffering being a shared experience with Christ is true, but then it should also be true of every experience that is not sinful. I meant that say, joy, may be a redemptive experience itself and not just the fruit of one. Perhaps however joy is the outgrowth of suffering in a special way. 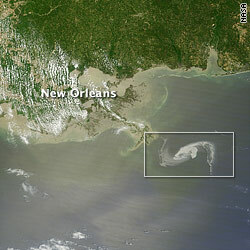 I guess most people are aware of the oil slick heading for the northern coast of the Gulf of Mexico, which includes the coasts of Florida, Alabama, Mississippi, and Louisiana. This may be a really huge disaster. Your prayers are solicited. The wind is now coming out of the south and expected to stay there for several days, which ordinarily I would be happy about, as a south wind tends to bring sand to my little strip of beach on Mobile Bay, rather than taking it away, as a north wind does. But that's insignificant compared to the harm this could do. Here is a Google image search showing some of the beaches that could be damaged or ruined. These are in Alabama; Florida of course has many, many more miles of similar beach. Possibly more significant, longer term, could be the harm done to estuaries and swamps, which provide homes and breeding grounds for all sorts of aquatic creatures, e.g. shrimp. I don't know what the chances are of it coming way up into Mobile Bay, to the area where I live. There is a lot of information at deepwaterhorizonresponse.com, none of it very encouraging. The literary spirit in politics consists in seeing what is ingenious and new more than what is true, in preferring an interesting tableau to a useful one, in showing oneself sensitive to actors who play and speak well regardless of the consequences of the play, and in deciding on the basis of impression rather than reasons. For “literary men” substitute “artists and intellectuals,” and you have a pretty good description of something very noticeable in our politics, especially if you expand “artists and intellectuals” to include those who wish to associate themselves with or be thought of as artists and intellectuals. I’m a little embarrassed to admit that I once thought poets and novelists—ok, I’ll go ahead and make the full confession—and even, in some cases, pop musicians had some sort of special insight into politics. Now I think that if they differ at all from the average person, it’s for the worse. The average person may operate mostly on emotion and impression; As & Is add a very powerful sense of fashion and aesthetics to that. And the fashion component seems usually to be unconscious and therefore unresisted. Of course Mansfield himself is most definitely an I (Harvard government professor). Why can't I take pictures like this? I guess I need a better camera. I want to recommend this excellent German movie about a priest imprisoned in Dachau who is given a nine-day furlough so that the Nazis can pressure him into helping them get his bishop to cooperate with the Reich. It's extremely well done (in German, with subtitles): more information here. I should warn you that it contains a few scenes, brief but powerful, of pretty rough violence. Most of it, though, takes place away from the prison. An interview with the director, Volker Schlöndorff, sheds some interesting light on the question of Christian art. I think most Catholics (and Protestants) who are interested in such things have had disappointing experiences with self-consciously Christian art—books, movies, whatever—that just isn't very well done, however well-intentioned it may be. This is an instance of the inverse: a very fine work of art by a non-Christian which presents Christian and specifically Catholic themes very skillfully and powerfully. Yesterday evening, during the rain, which we really needed, not having had any for several weeks. The wind chime looks so bright because the porch light was on. The camera never catches rain like I want it to, but you can see some faint vertical streaks. And it's still raining.It's actually rather dark right now, in mid-afternoon. Something that's really striking about most of the atheist commentators on that post is their anti-intellectualism. "We're plain simple folk here. We don't need none of your hi-falutin' nonsense about metaphysics." They're like people who know some simple arithmetic resisting algebra. "None of your slippery x and y stuff, now. Nothing but plain numbers for us, numbers we can count with!" Or the people who think Charlie Parker was just playing random notes, or that people only pretend to like classical music out of snobbery. They don't know what Hart is talking about, and they're proud of not knowing, and they don't want to know. There are a few exceptions, but very few. Francesca mentioned this a couple of days ago. I was at work and couldn't read it at the time. The next day I remembered that I had seen a mention of a good piece by Hart, but I couldn't remember where. Happily, I came across it again today. Anyway: no one need bother pointing out the shallow fallacies of Dawkins et.al. again--Hart has done the definitive job, and you may as well just point people to him. I was pleased to see that he emphasizes a point that I've made in a much less articulate and philosophically sophisticated way: that the NAs for the most part do not understand the ideas they believe they have refuted. I was also glad to see that he shares my admiration and indeed affection for Nietzsche, one of the few atheists who really sees deeply into the whole question and understands what atheism means. The comments on the piece are pretty dreary, though some of them could be funny if you were in the right frame of mind. Hart's work must have come to the attention of some atheists, and they have swooped in to demonstrate Hart's point. I left this remark in response: "They clearly didn't understand what they read, and furthermore they don't, and possibly can't, understand that they didn't understand. Not much you can say to that."